The tenth annual Hockey Day Minnesota Celebration, held this past weekend, was the Celebration's finest, boldest and most picturesque. Our beloved City of Duluth was the host site for this year's Celebration. I applaud Fox Sports North for selecting Duluth as the site to celebrate the sport of hockey. Their decision made sense since Duluth has embraced organized outdoor hockey since the 1890's. Duluth has a rich hockey tradition that generated statewide enthusiasm for having Hockey Day Minnesota 2016 hosted in our Zenith City on the Hill. What other Minnesota city hosted hockey games played on the ice cover of the Greatest of the Great Lakes? What other Minnesota city built a massive brick and stone structure in 1912 to house twelve curling rinks on the first floor and a hockey arena on the second floor? Our Duluth Curling Club was the predecessor to the grand hockey arenas of today. Duluth was established in 1856. It became a city in 1870. Its colorful history provided ample material for every intermission of every game televised as a part of Hockey Day Minnesota. Duluth is enjoying a nationally recognized renewal. It is an inspiring and heart-warming story of a community that rose from the ashes of hard economic times. Our community is a model for the revitalization of an industrial, blue collar town. More compelling still is how our community supported the sport of hockey throughout the most challenging of these economic times. We are a community that comes together around our love for hockey. We enjoy a collaborative environment wherein business leaders join hands and hearts with civic leaders and youth hockey leaders to move our hockey community forward. Hockey Day organizers witnessed this powerful collaborative effort while we proudly hosted a day dedicated to celebrating a sport that is so much a part of our collective past. 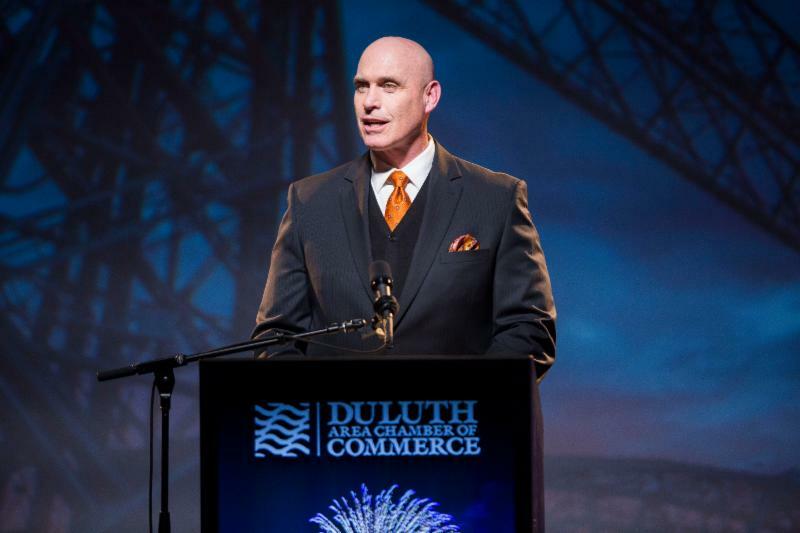 The Duluth Area Chamber is 1,140 members strong. We have been lifting up our beloved community since 1870. Our members have actively supported youth hockey since it began in the late 1890's. Congratulations to the volunteers who convinced Fox Sports North to choose Duluth as the site of the Celebration. Congratulations, as well, to the many volunteers who hosted the thousands of visitors who enjoyed this ideal place to play hockey.